Actual Southern California locations where "Grease" was filmed. remember differently in the song Summer Lovin'. and about 100 yards west of where Mulholland Highway meets Pacific Coast Highway & the ocean. including “The Karate Kid,” and “That Thing You Do,” "Baywatch", "Star Trek: DS9" and the “X-Files”. Most of the early Rydell High scenes were shot at Venice High School, at 13000 Venice Blvd., in Venice, CA. When the opening, animated credits stop, the scene dissolves from a cartoon to an actual shot of the school. were shot out in front of Venice High, with the camera looking south from Venice Blvd. stood in front of Venice High for decades, until it was vandalized. It was replaced with a new version in 2010.
girls were also behind the school, but closer to the main building (with the camera also facing north). northwest of the bleachers. It has had a roof added, so it looks rather different today. climbs down the drainpipe to join them. Meanwhile Sandy sings "Hopelessly Devoted" in the back yard. the Los Feliz district), a block and a half east of Vermont Avenue, and one street north of Prospect Ave.
the song Sandy (while cartoon hot dogs dance on the movie screen behind him). Alas, virtually all of Southern California's drive-ins have disappeared, and this one is no exception. typical suburban shopping center, with a Staples store and a Pavilion's supermarket. The "Frosty Palace" malt shop was once of the few exteriors which wasn't shot on location. 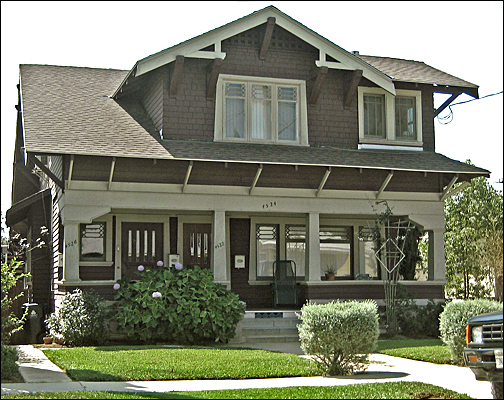 Instead, it was shot on a fake street on the back lot of Paramount Studios. Paramount Studios offers a guided tour where you can stroll through their back lot. 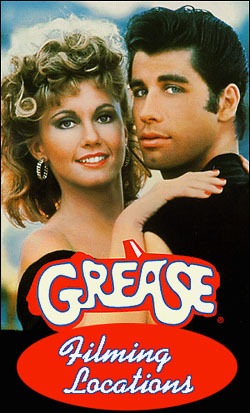 The photos on this page are stills from the DVD of "Grease"